If you live in an apartment or it is freezing and bitter outside, you can still garden under lights. The extra light and the growing plants help to take away the winter blues. Even if you don’t have a store-bought stand one can be made with a cast-off fixture, some cedar or treated lumber, screws, nails and cords. The best growth will occur under the maximum light you can provide. My stand has 4, four foot bulbs, 3 cool white to 1 grow light. Other stands have had 1 cool white to 1 high intensity light. The important factor to remember is that the higher the light intensity the broader the range of plants which will do well. I also like to mix the types of bulbs used since the cool white provide light in the blue/green range and encourage leaf growth, while the grow light and high intensity bulbs provide light also in the red range which encourages flowering. A timer can be used to regulate your plants’ days. A day period of 16 hours and a night period of 8 hours is beneficial for most plants. The longer day length helps to provide enough light for growth even though the light intensity is less than natural light. Plants do need a night time and I like to shorten the days to 13 or 14 hours to encourage some of my plants, which like shorter days, to bloom. Replace the bulbs yearly, as the light intensity decreases significantly even in the first few months of use. Keeping bulbs longer doesn’t save money compared to the poorer growth of the plants. I also like to get my plants as close to the light as possible and have my lights on adjustable chains to facilitate matters, but a block of wood or an upturned pot will do as well. Either trays or containers can be used to grow the plants in depending on what you want to grow. Some plant stands have a liner with or without a drain. You want to encourage root growth not root rot, so if the tray doesn’t have holes, water sparingly. Another good tip is to use a soil-less mix. I prefer to start seedlings in a soil-less mix due to the absence of problems with micro-organisms, drainage and aeration. I have planted lettuce seed in a tray, covered it up with plastic until germination begins and then left it to grow. If low humidity is a problem and out of your control you can wrap a sheet of clear plastic around the stand, but watch for fungus growing on the leaves and wet spots on your carpet . Depending on what I am growing, I use one quarter strength 30:10:10 or 12:36:14 every other watering. The former has a high nitrogen content and this encourages vegetative growth, while the latter has a high middle number or phosphorus, which encourages flower development. Be careful not to fertilize too much since the low light, compared to natural light, dictates that the plant will not need as much fertilizer. Your choice of plants will depend on what you want to grow. If you wish to grow vegetables leafy ones will do best such as lettuce, spinach and herbs. Lettuce is actually sweeter when grown under lights because strong light encourages the plants to form bitter-tasting compounds. Tomato plants are apt to get “leggy” but the tomatoes taste great. Impatiens, begonias African violets and geraniums are but a few of the flowers that will do well under lights. Vegetables are readily available so, aside from a few herbs, I prefer flowers in my plant stands. Growing under lights can help you to forget the weather outside besides providing you with pleasure and relaxation. Can you provide more information about the difference in light spectrum and energy consumption of LED lights and Flourescent tubes. Spectrum of light is the value of wave lengths on the light spectrum. This is usually represented in the sale of lighting by using a measurement of Kelvins (K) or temperature of light and is used as a reference to available light spectrum. Generally the base measurement and reference is Mid-day (Noon) on a clear day and would be an average of 5100-6500 kelvin, a white light which is made up of high levels of all spectrum of light FULL SPECTRUM 5000-6500 kelvin is the simplest way in relating if a light is adequate to providing all spectrum needed for ideal for germination, photosynthesis and blooming and fruiting. This is the standard range to achieve for plant lights. Most seed starting and growing LED’s use much less electricity compared to all other light sources. LED’s also last considerably longer, most will last around 50,000 hours. The main downside to LED’s is the upfront cost associated with setting up an LED system, but long term benefits are primarily the electricity savings weigh out over time and LED’s produce less heat. They are offered in full spectrum 6500K, and most have the ability to use switches to change the Kelvin settings for full control over what light is being offered at each stage of plant growth. Fluorescent lamps for indoor plant growth, especially high-output fluorescent bulbs are available in a wide range of spectrum's including full spectrum, which are the bulbs in the 5000-6500k range. Fluorescents are also adequate for starting and growing plants. However, bulbs tend to be short lived around 10,000 hours or less, can become overheated potentially causing damage to the plants or bulb itself and use up to 10 times the amount of electricity to illuminate and cover the same area a LED of the same coverage. In short and general terms, LED grow lights are more adaptable, longer lasting and comparatively cost efficient over time. The upfront cost may be a concern, but long term will prove to be a better investment. Additionally, I would like to add that the higher the wattage rating of a LED grow light unit will indicate its efficiency over an area. 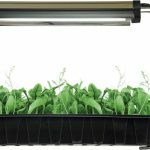 A 19 watt LED Full spectrum light hung 1 ft above plants would be adequate for one or two trays of seedlings or cuttings or 4.5 ft/sq, but not powerful enough for one or two flats of juvenile or mature plants. A 40 watt LED full spectrum light hung at 1 ft above plants would be more adequate for these. As a reference, a 500 watt LED full spectrum light hung 4 ft above plants would be adequate for a 8-10 ft/sq area of mature plants. Generally the larger the wattage the more intensity and coverage the LED lighting unit will have. Example: a single 19 watt LED seed starting Full spectrum 6500 k lighting unit has as much coverage and intensity as a single bulb Fluorescent T5 Full spectrum 6500k 54 watt seed starting light. 19 watt LED seed starting Full spectrum 6500 k lighting unit would cost $0.0285/day, $0.867/mth, and $10.409/ yr.
54 watt single bulb Fluorescent T5 Full spectrum 6500k seed starting light would cost you $0.081/day, $2.465/ mth, and $29.585/ yr.